[Episcopal News Service] For the Diocese of Maryland, the road toward recovery has been marked by deep, soul-searching conversations and policy changes, as well as a willingness to name and confront the challenges of addiction. A fatal accident in late 2014 caused by a bishop triggered intense scrutiny from the public and from within the diocese. It also initiated a churchwide re-evaluation of alcohol and addiction policies. The Diocese of Maryland has spent the past four years in recovery, asking difficult questions: What is our relationship with alcohol? How can we have honest and open conversations about addiction? How do we identify those struggling with addiction and support them in seeking help? What systemic changes need to be made within the system? And most of all, they asked this question over and over: What can we do to seek healing for all involved? Two days after Christmas in 2014, Heather Cook, then Maryland’s suffragan bishop, struck and killed cyclist Tom Palermo, a 41-year-old father of two. Cook’s blood alcohol level was .22 percent, nearly three times the legal limit for driving in Maryland. Both the justice and ecclesiastical systems responded: Cook is currently in prison, serving a sentence for vehicular manslaughter. 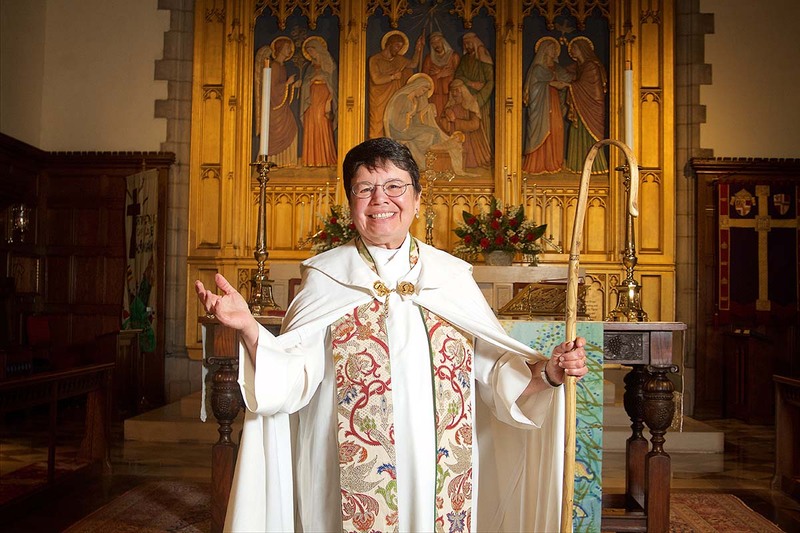 She resigned her position with the diocese and was deposed, so she can no longer function as an ordained person within the Episcopal Church. While the action has been adjudicated, the work of recovery is ongoing. A month after the accident, Church of the Redeemer held its first Recovery Eucharist, a service built around the program promoted by Alcoholics Anonymous and other 12-step-recovery groups. That service is now an annual offering. The Rev. Anjel Scarborough was serving at Grace Episcopal Church in Brunswick when the accident occurred. Like at Church of the Redeemer, the congregation offered a Recovery Eucharist shortly after the accident and has continued its role as a leader within the rural community about ways to support recovery. In 2014, there was only one AA meeting offered in town; Scarborough noted that three years later, other churches have joined the efforts and a 12-step meeting is now offered every day of the week within a five-mile radius. This past Labor Day, the town held a community-wide event to pray for victims of addiction. The congregation made other changes, too. The members decided that all church functions held on church grounds would be alcohol-free. The Recovery Eucharist became a monthly offering on Sunday evenings, and over the years, some members of the recovering community became involved in other activities at Grace. Shortly after the accident, the Episcopal Church convened a task force to examine the issues of alcohol and drug abuse, and the 2015 General Convention passed three resolutions, including policies about serving alcohol at church functions. The Diocese of Maryland further strengthened those policies and has been proactive about implementation. Slater offers some simple, no-cost ways to adhere to both the letter and spirit of the policy, from providing alcohol-free zones at the diocese’s conference center to placing alcoholic beverages at the far end of a room and soda, water and fruit juices in more accessible locations. The diocese also has collected resources and developed a page on its website. For Slater, the issue is personal on many levels. A recovering alcoholic himself, he knows intimately the struggle with addiction. Cook called him from the scene of the accident, and he took her to the police station. He lives two blocks from the family of the victim and regularly sees Palermo’s widow walking her children to school. While Slater and others were in the diocese when the accident occurred, Maryland Bishop Chilton Knudsen came several months later, in part to help lead the healing process. Knudsen, who served as the eighth bishop of Maine from 1997 to 2008, has been a public voice for the Diocese of Maryland’s ministry of recovery and support for those in addiction. She recently celebrated 30 years of sobriety. Knudsen regularly visits Cook in prison. “Heather is my sister in Christ and my sister in recovery,” she said. Knudsen gauges the diocese’s recovery on a number of factors, including how and when people talk about Cook. For a while, the discussion focused on blame, with anger directed at Cook, as well as the diocese and the larger church. In tangible ways, that has meant a number of changes toward building and encouraging an atmosphere of health. The diocese has held a series of clergy gatherings, with a particular focus on how to tell the truth to one another, how to ask for and extend forgiveness, and how to monitor the quality of discourse. The entire diocesan staff underwent training for Narcan, a medication used to reverse the effects of opioid overdose. Now, many parishes are also taking the training and learning how to be first responders, said Knudsen. Another indication of this healing work: Knudsen said she knows of seven clergy who have entered into recovery. For Scarborough, this period of recovery has helped shed light on addiction. While she believes the diocese and many individuals have come a long way in the healing process, Scarborough acknowledges that challenges continue.